Save yourself time and pre-register now! I understand that registration is not complete without parent signature, which must be completed in person. We are thrilled to announce audition dates for the 2018-2019 season! All dancers should arrive in a leotard or a crop top and shorts with shoes for both ballet and jazz. Hair should be in a clean, slicked bun. Registration will begin 15 minutes prior to each audition time slot. Dancers should be stretched and warmed up prior to their audition time. There is a $20 audition fee payable at the door by cash or check. Results will be e-mailed no later than 8:00 PM the same evening. Also be on the lookout for more information on our Guest Artist Workshop on June 20-22! Underground Allegro is pleased to announce dates for our summer workshops! If you have been thinking about becoming part of our team, now is your chance! Come train with us in a series of guest workshops and summer intensive classes. Announcing Last Chance to Dance 2017! SCROLL DOWN TO MEET OUR FACULTY! All guardians to those students under 18 will be required to sign a release form prior to their participation in our intensive. Please bring in your signed copy at the start of classes. You're invited to join us at Underground Allegro for our second annual winter workshop, Last Chance To Dance! follow us (@undergroundallegro) to hear more about each master instructor! Each day will be filled with two, 1.5 hour long classes in a variety of styles. Classes will take place from 9:30a-12:30p and are open to intermediate and advanced level dancers ages 10 and up. Parents are welcome to drop of their dancers or stay and watch the fun in our parent lounge! All dancers should come dressed appropriately for each dance style. A schedule with styles and instructors for each day will be emailed out December 18th. We are located at the corner of Route 25 and Wilson Street. There is ample street parking as well as a parking lot directly behind our building on River Street. Professionals and college students must show proof by id or pay stub. **No discounts apply to single day or single class costs. **Payments made before prior to the December 27th may be made by credit or check. **There are no refunds unless class is canceled for weather related reasons. Join us from 8-10 am on September 23rd to find out firsthand what makes our program so different from other dance studios. Use the morning to observe class with the Underground Allegro Dance Company and afterward enjoy complimentary refreshments and face painting. Located adjacent to the Downtown Batavia Farmer's Market, this is the perfect opportunity to enjoy all our location has to offer! Looking to take your training to new heights? 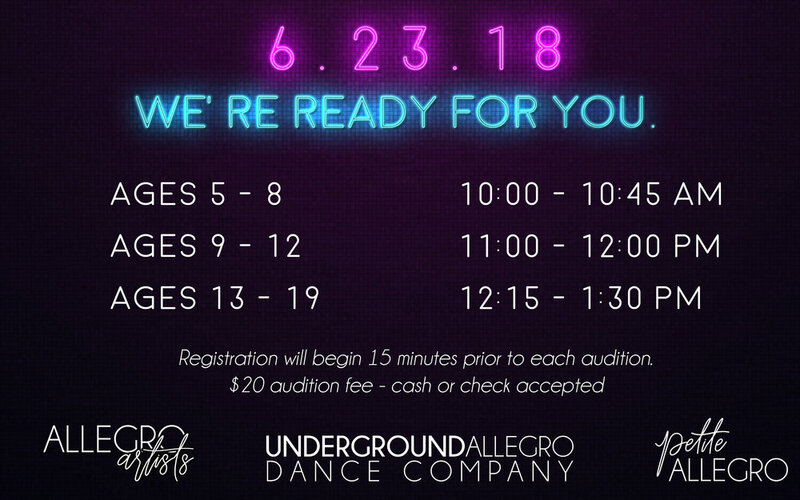 Underground Allegro is currently enrolling students for our fall session! 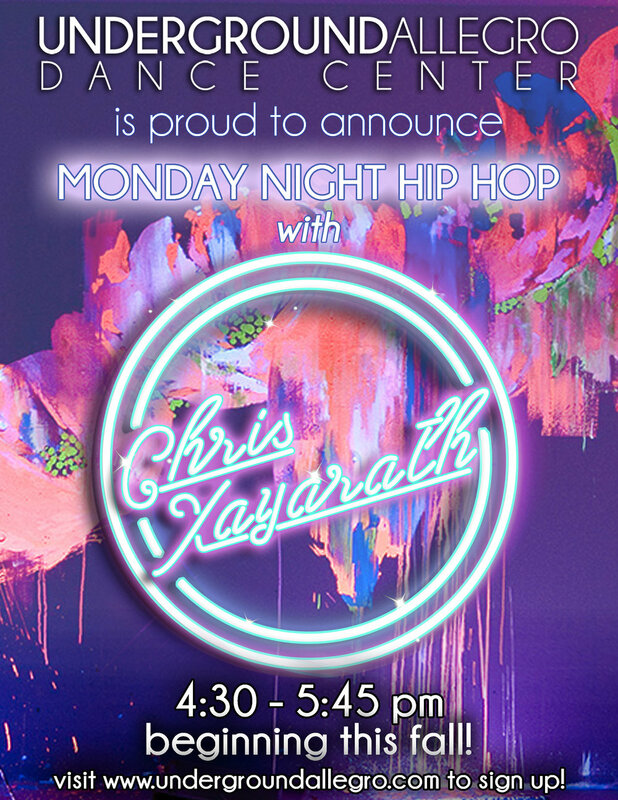 INTRODUCING WEEKLY HIP HOP WITH CHRIS XAYARATH! 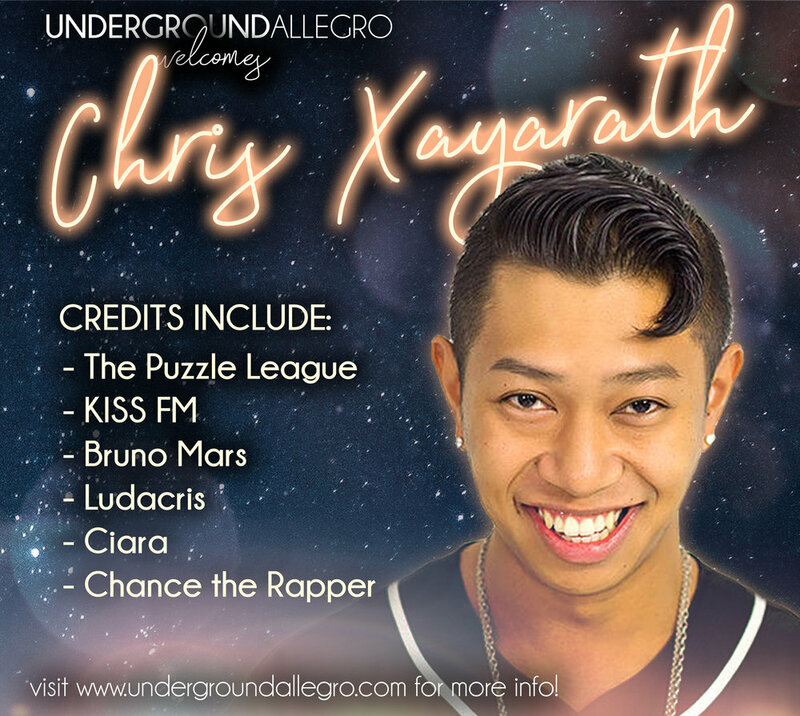 Underground Allegro is proud to announce Monday Night Hip Hop classes with Chris Xayarath beginning this fall. Chris is one of Chicago's most highly sought after teachers and we are so excited to welcome him to the UADC family! JOIN US AT OUR OPEN HOUSE THIS SATURDAY THE 24TH! We can't wait to share our new studio with you! Join us this Saturday for giveaways, refreshments, and free classes. Children ages 3-8 may participate in free trial classes! Dancers ages 9+ may observe our intermediate/ advanced level classes to see how amazing YOU could be by training with us! ANNOUNCING HIP HOP WORKSHOP WITH CHRIS XAYARATH! E-mail to reserve your spot! Dancers must be ages 10+. $20 cash or check payable at the door.